Nine multiparous mid-lactation Holstein cows, averaging 171 ± 17 days in milk and producing 24.1 ± 3.3 kg of milk/d were assigned to a replicated 3 × 3 Latin square design to study the effects of altering the non-fibre carbohydrates (NFC) to rumen degradable protein (RDP) ratios on rumen and plasma parameters and nitrogen (N) metabolism. Diets were based on a barley concentrate and 45 forage to 55 concentrate ratio. Rumen degradable protein (g/kg) and NFC : RDP ratios averaged 98 and 4.10; 108 and 3.71 and 118 and 3.34 for the LRDP, MRDP and HRDP treatment diets, respectively (dry matter (DM) basis). Ratios were achieved through altering the RDP content of the diets while NFC was held constant at 401 g/kg DM. Urea was supplemented as a source of RDP to decrease the ratio. The effect of treatments on NH3-N concentration in rumen fluid and plasma urea nitrogen (PUN) was significant and increased linearly. Nitrogen intake, absorbed N and urinary N increased linearly between LRDP to HRDP. As a proportion of N intake, faecal N tended to decrease linearly from the LRDP diet to the HRDP diet, i.e. as dietary RDP increased. As a proportion of N apparently absorbed, milk N tended to decrease linearly from LRDP to HRDP as dietary the NFC: RDP ratio decreased. Results showed that indicators of the metabolic efficiency of N were more affected than milk yield, confirming that low producing cows are less likely to respond to altering NFC : RDP ratios. Hence, balancing rations to further improve the N utilization efficiency may be of a higher priority. During the last few years concern about the potential contribution of intensive dairy farming to nitrogen (N) pollution has escalated. Consequently, research and modelling efforts have been focused on identifying management and nutritional strategies to reduce the excretion of N into the off-farm environment (e.g. St-Pierre & Thraen, 1999). Results from these studies suggest that improving the efficiency of N utilization by dairy cows, which in most production schemes rarely exceeds 25 to 30%, is the most promising way to decrease N losses on dairy farms with minimal detrimental effects, if any, on productivity and profitability. Reducing the output of N in urine provides the greatest opportunity for achieving that goal (Ipharraguerre et al., 2005). This is because most of the N present in urine arises from inefficient N transactions in the rumen and peripheral tissues that may be amenable to manipulation (Ipharraguerre et al., 2005). These are partly supported by recent studies that showed that a reduction in N intake while correcting for predicted shortages of limiting amino acids (AA) for milk production can be achieved by including rumen undegradable protein (RUP) supplements (Castillo et al., 2001; Noftsger & St-Pierre, 2003) and (or) rumen protected amino acids (Leonardi et al., 2003; Noftsger & St-Pierre, 2003) in the diet. This can reduce the excretion of N in urine but sustain the production of milk and milk protein. In these studies, dietary crude protein (CP) was reduced by replacing high-protein supplements with cereal grains, sources of non-fibre carbohydrates or protein supplements lower in CP. In these studies non-fibre carbohydrate (NFC) levels differed from 40.5 to 42.7% (Kalscheur et al., 2006), 40.8 to 45.3% (Ipharraguerre & Clark, 2005), 43.8 to 46.0% (Flis & Wattiaux, 2005) and 34.2 to 39.6% (Davidson et al., 2003). On the other hand, in many investigations, the ratio of rumen degradable protein (RDP) to RUP is often changed while the CP content remained constantly. Results from these experiments are difficult to interpret because the increasing concentration of RDP is confounded with the decreasing concentration of RUP. The effects of RDP deficiency can be masked by excess RUP, for example, reduced microbial protein from lack of RDP may not influence milk production if RUP substitutes for the microbial protein lost and more RUP allows for greater recycling of N back into the rumen (Kalscheur et al., 2006). Consequently, in these experiments the amount and form of N and carbohydrate available in the rumen and intestines might have differed between treatments. Therefore, it remains unclear whether the reported effects on N excretion and cow performance were achieved independently of alterations in rumen metabolism and the post-rumen supply of N and carbohydrate. In the present study the objective was to study the impact of reducing the amount of RDP while dietary NFC and RUP levels remained constant, on N metabolism in dairy cows. Data collection for N balance measurements was done, using nine multiparous Holstein cows. At the start of this study the cows were 171 ± 17 days-in-milk (DIM ± s.d. ), weighed 635 ± 52.5 kg and produced 24.1 ± 3.3 kg milk/d. The experiment was designed as a 3 × 3 Latin square trial with 21-d periods (14 d for adaptation and 7 d for sampling). Cows were assigned randomly within square to the three dietary treatments. The sequence of treatments was different in each square and was selected to balance for carryover effects. Cows were assigned to each square according to parity and current milk production. Cows were housed in tie stalls with free access to water. Cows were milked three times daily (04:00, 12:00 and 20:00). Three isoenergetic total mixed rations (TMR's) were prepared, based on NRC (2001) recommendations. Treatment diets were formulated to contain a fixed level of non-fibre carbohydrates (401 g/kg dry matter (DM)). The treatments were: a low RDP (LRDP), a medium RDP (MRDP) and a high RDP (HRDP) diet which contained respectively 143, 153 and 163 g CP/kg DM; 98, 108 and 118 g RDP/kg DM and NFC : RDP ratios of 4.10, 3.71 and 3.34, respectively. Diets were formulated for cows that produced 24 kg of milk daily (4% fat and 3% protein), consumed 20.4 kg of DM daily, weighed 630 kg and were 171 DIM. Urea was added to increase the level of CP and RDP in the diets. Dietary ingredients and chemical composition are reported by Afzalzadeh et al. (2010). The concentrates were based on barley grain and cottonseed meal. Prior to feeding, forages were chopped through a 7 cm screen in a rotor-type thresher. The concentrate to forage ratio was 55 : 45 in the diets. Faecal grab samples were taken 4 h after feeding from d 15 to 18 and daily samples were composited and kept refrigerated for the duration of the collection period. At the end of each collection period, the samples were composited per cow and kept frozen at -20 ºC until analyzed. Faeces were analyzed for CP (Kjeldahl N × 6.25). Rumen fluid was collected from each cow approximately 3 h after morning feeding on day 21 of each period, using a stomach tube connected to a vacuum pump. Samples were strained through two layers of cheese cloths and the pH was measured immediately, using a pH meter (Fisher Scientific, Toronto, ON). After measurement of pH, a sub-sample was acidified to pH <2 with an appropriate volume of 50% H2SO4 (vol/vol), placed on ice for transportation, centrifuged at 6000 × g for 10 min at 4 ºC, and the supernatant was frozen at -20 ºC for later analyses. Rumen fluid was thawed, and the supernatant was removed and analyzed for ammonia (Broderick & Kang, 1980). Blood samples were collected in sodium heparin collection tubes from the coccygeal vein of cows on day 20 at approximately 2 h post feeding, were centrifuged for 15 min at 2500 × g, and plasma was harvested and frozen at -20 ºC until analysis. The plasma glucose was determined using an Eppendorf autoanalyzer kit (EPOS 5060 model from Sigma Chemical Co., St. Louis, M.O. ), and the urea concentration was assayed using the method described by Chaney & Marbach (1962). Total protein was determined calorimetrically (Coulter kit no. 7546061, Hialeah, FL). Data were analyzed using Proc Mixed of SAS (SAS, 2002). The original model included square × treatment and square × period interactions but these interactions were not significant for any variable and were pooled with the error term in the final model. The final model included square, period and treatment. Cow within square was the term of the RANDOM statement. Values reported as least squares means. Diet effect (i.e. different NFC : RDP ratios) was partitioned into linear and quadratic contrasts. Significance was declared at P <0.05, and a trend was noted if 0.05< P <0.10. Dietary RDP had no effect on rumen pH (P >0.05). However, increasing RDP from 9.8 to 11.8% resulted in significant linear increases in ruminal ammonia concentration (P <0.01; Table 1). Dietary RDP had no effect on the glucose and total protein concentration of plasma. However, decreasing the NFC : RDP ratio from 4.7 to 3.34 resulted in significant linear increases in plasma urea N (PUN) (P <0.01; Table 1). As presented by Afzalzadeh et al. (2010) the level of MUN increased (P <0.01) from the LRDP to HRDP treatment. In previous experiments, increasing the CP content of the diet did not affect rumen pH and consistently enhanced the concentration of NH3-N in the rumen (Klusmeyer et al., 1990; Christensen et al., 1993; Cunningham et al., 1996). The concentration of ammonia in the rumen is a function of both rate of rumen N degradation and concentration of RDP above microbial needs and the amount of dietary energy available to the rumen microorganisms. In most feeding systems microbial protein synthesis is assumed to be energy-dependent (Tamminga et al., 1994; NRC, 2001). The addition of rumen available N (from urea) in the HRDP diet resulted in a 30% increase in rumen ammonia concentration in this experiment. Increasing CP concentration or degradation of dietary protein usually resulted in increased ammonia concentrations in the rumen (Davidson et al., 2003). The ruminal NH3-N concentration on all diets remained above the 3.5 Mm, suggested (Satter & Slyter, 1974) as the minimum necessary for maintenance of rumen bacterial growth. Concentrations of PUN were affected by dietary RDP concentration in the present study, in agreement with Broderick & Clayton (1997). Levels of PUN were similar to those of MUN (Afzalzadeh et al., 2010) and rumen ammonia as a result of treatment, which is expected because rumen ammonia not incorporated into microbial protein, is absorbed across the rumen wall and converted to urea in the liver for either excretion in urine, secretion in milk, or recycling to the rumen through saliva (Moscardini et al., 1998). Plasma urea nitrogen is the major end product of N metabolism in ruminants, and high concentrations are indicative of an inefficient utilization of dietary N (Nousiainen et al., 2004). Data for N metabolism are presented in Table 2. Increasing dietary RDP resulted in a linear increase in N intake (P <0.01), N apparently absorbed (P <0.01) and urinary N (UN) (P <0.05). Pollution N tended to be significant between treatments (P = 0.05), and increased linearly from LRDP to HRDP. As a proportion of N intake, faecal N tended to decrease linearly from the LRDP diet to the HRDP diet as dietary RDP increased (P = 0.10). 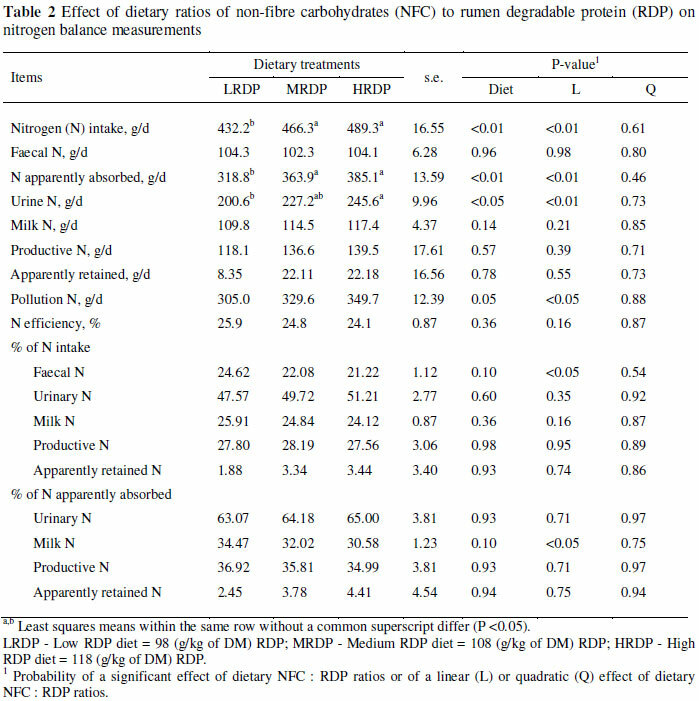 As a proportion of N apparently absorbed, milk N tended to decrease linearly from LRDP to HRDP as dietary NFC: RDP ratio decreased from LRDP to HRDP (P = 0.10). As expected, the intake of N increased linearly as the CP content of the diet increased. Secretion of N in milk (g/d) was not significantly different across treatments. There were no significant differences in daily faecal N excretion by cows as a result of dietary treatment, in agreement with Kalscheur et al. (2000). Over the range of CP intakes in this trial, faecal N as a proportion of consumed N declined from about 24.6 in the LRDP to 21.2% in HRDP treatment. Faecal N primarily consists of indigestible microbial protein produced in the digestive tract, as well as endogenous protein, sloughed cells from the digestive tract and undigested feed protein (Mason, 1969). Because undigested feed protein is a minor component of total faecal N, treatment differences in faecal N were not expected. 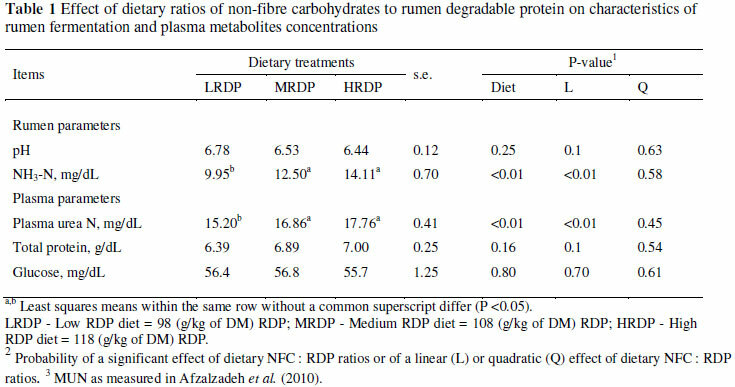 The increase in apparent digestibility of protein for the MRDP (Afzalzadeh et al., 2010) resulted in the decreased faecal N excretion in MRDP diet. Daily excretion of UN was significantly higher in cows consuming the HRDP than the other two diets. When daily UN excretion was calculated using the equation developed for Holstein cows by Kauffman & St-Pierre (2001): UN (g/d) = 17.64 × MUN (mg/dL), the UN was equal to 200.6, 227.2, and 245.6 g/d for LRDP, MRDP and HRDP, respectively. Obviously, part of the increased N intake from a high supply of RDP is lost in urine. Therefore, the optimal RDP content should be based not only on milk production, but also on N excretion and associated environmental consequences. The greater quantities of N metabolites to be excreted and, probably, limited ability of the kidneys to concentrate urea N concentration in urine (Sannes et al., 2002), would increase the volume of water to dilute these compounds. Elevation of UN output was substantial. Increased loss of N in urine is the most common effect observed with high CP/RDP diets and the observed tendency for increased absolute and proportional losses of N with the MRDP and HRDP in the present trial corresponds to reports by Castillo et al. (2001) and Leonardi et al. (2003). Kebreab et al. (2002) reported a greater and exponential effect of N intake on urinary N with limited effects on faecal or milk N excretion. Castillo et al. (2001) reported that, above a 400 g N intake/d the proportion of N excreted in urine increased exponentially whereas proportionate N output in faeces and milk declined linearly. Castillo et al. (2001) suggested that a reduction in dietary CP from 190 to 150 g/kg diet DM would reduce urinary N excretion from 225 to 151 g/d without significantly altering milk production. Excretion of N in urine increased linearly as the CP content of the diet was increased. In this trial, the average increment in UN excretion was 22.5 g/d for every one percentage unit increase in dietary protein, compared to 27 g/d reported by Cressmann et al. (1980) and 24 g/d reported by Groff & Wu (2005). This pattern of change in UN and faecal N excretion is consistent with observations made in many other studies utilizing different dietary protein concentrations. When dietary protein was changed from 165 to 194 g/kg (Davidson et al., 2003), from 165 to 177 g/kg (Wattiaux & Karg, 2004) and from 170 to 184 g/kg (Noftsger & St-Pierre, 2003), only UN excretion increased. This suggests that feeding protein in excess of requirements not only increases total N excretion, but also increases the risk of N loss to the environment, because urine is more labile than faecal N (Varel et al., 1999). The percentage contribution of faecal N, UN, milk N and retained N to total excretion are presented in Figure 1. In this experiment, N efficiency declined from 25.9 to 24.1% as CP intake increased between the LRDP to HRDP diets (Figure 2). Broderick (2003) clearly demonstrated the negative effect of dietary CP on the efficiency of N use for milk protein synthesis in dairy cows. A meta-analysis of a large data set confirmed the negative relationship between dietary CP and milk N efficiency (Hristov et al., 2004). As the CP and RDP levels in the diet increased the efficiency of converting intake N to milk N decreased substantially, dropping from 25.9 in the LRDP diet to 24.1 in the HRDP diet. Consequently, the amount of UN increased because most of the additional absorbed N was not used for additional milk N production. This implies that an increase in the dietary RDP level may result in an increased output of N to the environment. 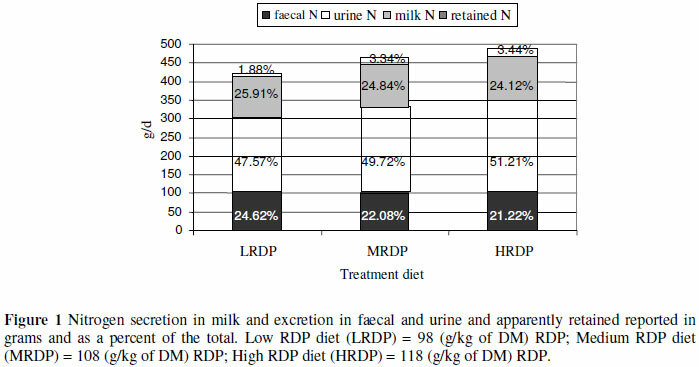 Overall, cows fed the HRDP diet excreted more N (13%; P = 0.05) in faeces plus urine than cows on the LRDP diet, but as proportion of N intake, N losses were similar between diets. Castillo et al. (2001), from an extensive review of published studies, reported that on average, 72% of the N consumed by dairy cows was excreted in the faeces and urine with a linear relationship between N intake and N excreted in faeces and urine. Total N excretion (faecal and urinary) linearly increased from 305 to 349.7 g/d as dietary RDP was increased from the lowest to the highest concentration. Data on faecal and UN concentrations (Table 2), suggested that, overall, as the intake of N increased more, N was excreted, resulting in decreased efficiency of N utilization. Results showed that indicators of metabolic efficiency of N were more affected than milk yield (Afzalzadeh et al., 2010), confirming that low producing cows are less likely to respond to altering NFC : RDP ratios. Hence, balancing rations to further improve the N utilization efficiency may be of a higher priority. Decreasing dietary RDP from 118 to 108 g/kg and CP from 163 to 153 g/kg DM did not affect production of milk or FCM, but reduced estimated excretion of the environmentally labile UN, and increased estimated N efficiency. Results from this study indicated that diets containing respectively 153 and 400 (g/kg DM) CP and NFC, supported maximal production in mid-lactation dairy cows with minimal N excretion to the environment compared with diets with a higher CP content. We sincerely acknowledge and thank the University of Tehran, Agricultural Faculty of Abouraihan for their financial support.